Daily charts and field notes for the 2015 Hawk-count season as submitted by Dave Wheeler. A huge thanks to all who helped with the count this year. Too many people to list, who contributed bird spottings, fed the counter, kept the count while the counter was setting up, otherwise disposed, switching lookouts, etc… Special thanks to Bill Purcell, who year after year has provided the counter with much-needed days off. This year was no exception. I availed myself of Bill’s skill level many times by pointing in the sky and asking him to confirm a high or ambiguous bird. All our regular visitors contributed in their own way to the completion of a great season. Hot, moderate SW wind, mostly sunny to mostly cloudy, thunderstorms in the afternoon. Decent flight by recent standards. Eight species is good diversity. Young Cooper’s and Sharp-shinned Hawk were great to see. 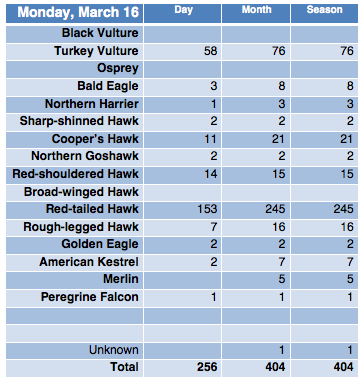 Last three birds of the official count were 2 Osprey and a Bald Eagle. many species are possible. Thursday has some potential. The official hawk count season may be over, but the birds don’t know that!!! SE wind, sunny, warm, until 3 pm when lake breeze took over. Immature Red-shouldered Hawk was nice. Three Glossy Ibis flew in from the corner of the lake and south over the #9 sign. SATURDAY: S wind, partly cloudy, storms possible ahead of the cold front. Could be a few birds. SUNDAY: N wind and huge drop in temperature after cold front passes. Expect “no count conducted” on this last day of the official season. 9:00 a.m to 11:00 a.m.
Strong W wind developed after passage of cold front. Mostly cloudy skies becoming clear. FRIDAY: Hot, sunny, SE wind, lake breeze will probably take over but could be hawks until it does. 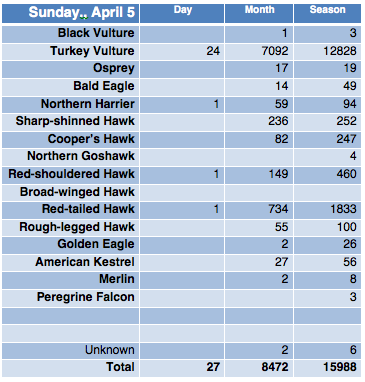 SUNDAY: Cold front and strong NW wind equal no count conducted on this last day of the official season. 7:00 a.m to 3:00 p.m. Decent speed to SW wind but became NE or NNE about 2 p.m. as lake breeze flexed its muscles. Mostly cloudy to mostly sunny skies and everything in between. Count remained at north lookout. Northern Harriers. They are one of our most attractive birds and best silhouette. Small number of Cedar Waxwings and Blue Jays were on the move. Not much new in the hedgerows but Blackpoll Warblers continue to be heard singing. Filing this report before Wayne Fidler’s Common Nighthawk count for the evening is complete (but we are expecting birds). THURSDAY: W wind and cooler, following cold front passage. Not expecting many hawks. afternoon. Rain-free and/or sunny interludes could have birds. Last week in May is a very good time for Mississippi Kite. SUNDAY: Strong N wind after cold front passage. Last day of official daily count likely to end with “no count conducted”. SW wind becoming W, then lake breeze taking over and becoming NE and NNE. A few birds on the W wind before shift to NE and move to south lookout. Another Broad-winged Hawk with no tail. A few Cedar Waxwings and Blue Jays, including one Blue Jay with no tail. Singing Blackpoll Warblers. 189 (!!!) Common Nighthawks counted by Wayne Fidler between 7-9 pm. WEDNESDAY: SW wind hopefully holding off the lake breeze since it will be 10 mph plus. Could be a good flight if that’s how it plays out. THURSDAY: W wind probably becoming WNW. FRIDAY: light south, expect lake breeze to take over. SATURDAY: stronger SW wind, could be good. SUNDAY: last day of official count. N wind, likely “no count conducted”. Hot, SE wind becoming SW after warm front passage. Ninety minutes of strong raptor movement when the sun came out. Of 30 Bald Eagle, at least 4 were adults. Hummingbirds, Blackpoll Warblers in the trees, Chimney Swifts, American Goldfinches. A little much for me to keep up with alone. Several intriguing flocks got through while I was looking elsewhere – ie interesting call note. A few warblers on the move but little new in the hedgerows. A few Nighthawks in the evening. NEXT FEW DAYS: hot, partly sunny, SW wind, some chance of sprinkles or t’storms. Sunny periods should have more Bald Eagles and Broad-winged Hawks. These late-season flights of young birds can be as impressive as April flights, just harder to predict. Rarity potential is high. Recent pattern has been S wind morning, evening, and overnight, with full sun and lake breeze kicking up for the mid-day hours (usually starting by 9 a.m.). A few Broad-winged Hawks early in the count. Blackpoll, Nashville, and Yellow-rumped Warblers, all but the Yellow-rumped Warbler were singing males. Also a few Cedar Waxwings on the move and still a few Blue Jays, plus a Scarlet Tanager. Evening featured 75 Common Nighthawks counted by Wayne Fidler. MONDAY-WEDNESDAY: SSW or SW wind, partly cloudy, some chance of rain, warm. If the rain and/or lake breeze holds off, we’re due for a flight of Bald Eagles and Broad-winged Hawks. Big numbers are possible under the right conditions. Not sure if one of these days will produce. With S wind overnight we should continue to see a trickle of late songbird migrants. 9:15 a.m to 12:15 p.m. Nothing really flying under these conditions. Immature hawks are due, coming days look better. Wilson’s Warbler continues at the north lookout. Next burst of songbirds, if there’s going to be one, is waiting on weather change. Sounds a lot like yesterday’s comments I’m afraid. My photo page also looks a lot like it did yesterday but new updates will be coming soon. 9:15 a.m to 12:45 p.m.
Strong NW wind, mostly sunny. Nothing really flying under these conditions. Wilson’s Warbler continues at the North Lookout. Next burst of songbirds, if there’s going to be one, is waiting on weather change. SATURDAY: W wind, full sun, could be a few birds especially if stays W rather than becoming NW due to lake breeze. If W wind then watch could be at either lookout. for new songbirds. Immature Broad-winged Hawks and Bald Eagles are due. Could be some raptors. MONDAY-on: going into a few-day period with light S wind, mostly overcast, chance of rain. 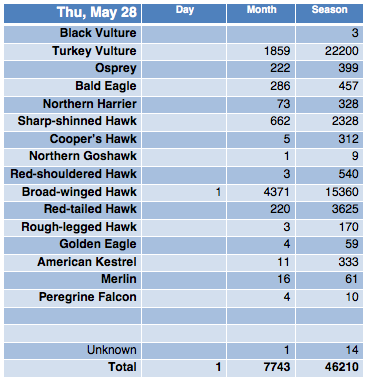 One of these days might give us a good flight of young hawks, and probably will see the last-of-season songbird migrants. Blue sky and NW wind, not late May flight weather. Chilly with 15 to 20 mph WNW winds. SE wind becoming SW until passage of cold front, then W increasing and clear skies. of the Bald Eagles were adults or nearly so. No real morning flight and nothing really new in the hedgerows. Not a lot of Blue Jays or waxwings. Six Green Heron going into the marsh. Highlight, by far, was a flock of approximately 60 Dunlin that came low from due south and passed over going due north. This is an unusual passage trajectory for Derby Hill, with only loons typically following it. Killdeer and Solitary Sandpiper, by far our most commonly seen shorebird migrants, usually appear in the WSW sky and pass in the same way our hawks and most other birds do. The Dunlin popped up instantly very low behind sign number 9, not a place we normally look for our birds to “horizon” or be first seen. Was lucky to get photos of the close, geometrically morphing flock. WEDNESDAY: Strong WNW wind, not expecting much honestly but we haven’t had many strong winds in May so who knows. THURSDAY: W wind, not very promising. FRIDAY: S wind overnight seems favorable for songbirds, becoming N during the day. High pressure is in control for the next few days which isn’t a good thing for big flights of immature hawks. 7:00 a.m to 5:00 p.m. SE wind mostly but lake breeze some of the time. Hot. Mostly sunny. Several thunderstorms. Immature Red-shouldered Hawk and a late-day flight intercepted by Wayne Fidler and Bill Purcell between 3-4 pm. Thanks to them for keeping count. 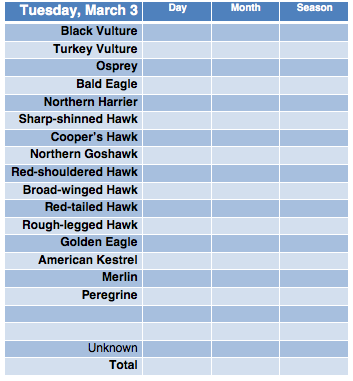 Short-tailed Hawk reported passing Braddock Bay but so far we have not seen it. Warblers around. Male and female Cape May Warblers. TUESDAY: Light S wind ahead of the cold front, then becoming W wind. Front may pass too early in the day for a pre-frontal flight to develop, but we can only hope. 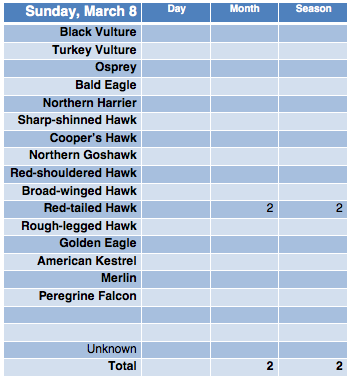 Will be watching for Short-tailed Hawk reported by Braddock Bay. WEDNESDAY: Strong W or WNW wind and much cooler. Not many hawks expected. Foggy with little visibility through 11:00 a.m. Intermittent fog at north lookout thereafter. Sun at the south lookout after 11:00 a.m. N wind. Little moving in the fog, a few Broad-winged Hawks at the south lookout after it cleared. Immature birds aren’t going anywhere but moving with the wind. If the wind doesn’t bring them here, we won’t see them. Common Nighthawks in the evening, birds around in the morning. My guess is that we’re still missing a lot. MONDAY: SE wind becoming SW, hot, partly sunny becoming mostly cloudy with chance of rain increasing as the day wears on. South winds should bring us birds of all types if they are in the area. TUESDAY: S wind and chance of rain overnight, becoming strong W with cold front passage. Depending on rain, there could be birds ahead of the front. WEDNESDAY: Strong W wind, cooler, probably not good for migration. Light S wind becoming light N with fog rolling in. My apologies for the lateness of this report. Little hawk movement before fog rolled in for the remainder of the day. There was a small morning flight and many warblers around in hedgerows continuing through most of the day. Some Palm Warblers left and a single Ruby-crowned Kinglet. 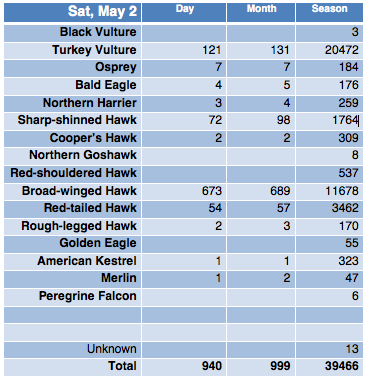 Other than Blackpoll, no mid-late-May species noted. Horned Grebe was observed on the lake. Blue Jays continue including one flying with no tail. SUNDAY: Saturday ended with fog, Sunday likely to start the same way. NW wind, warmer, sunny if the fog lifts. Sounds lousy. MONDAY: Light SE wind to light S or SW, partly sunny to mostly cloudy. Rain possible in later afternoon. Has potential depending on the rain and strength of wind. TUESDAY: Light S wind and rain possible during the overnight. SE wind shifting to strong W during the day. Not sure what it all means. Songbirds could be moving. Light SE wind but enough to prevent lake breeze. Partly sunny conditions mid-day becoming mostly overcast with a diffuse sun. Given the conditions a very disappointing flight overall. 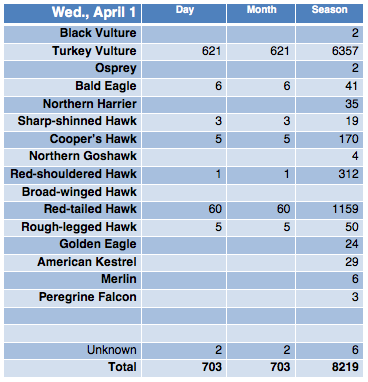 Obviously not much “supply” of Broad-winged Hawks, Red-tailed Hawks, etc. 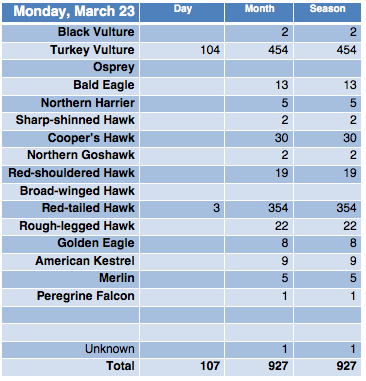 A decent number of Bald Eagles and a few Northern Harriers were seen. 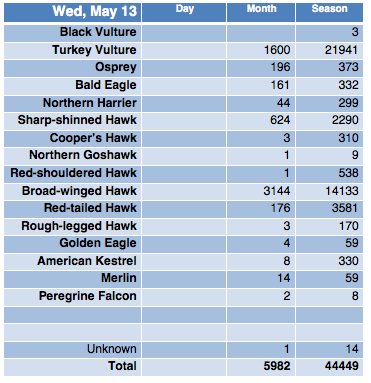 Peregrine Falcon was the highlight. Decent morning flight occurred, especially after 8:30am. Good number of Chimney Swifts going by, also many American Redstart, American Goldfinch, some Pine Siskins. A few Scarlet Tanager, Indigo Bunting, Rose-breasted Grosbeak, Baltimore Oriole but nothing like what’s possible. Blue Jays continue. Three Common Terns and a Black Tern. A reasonable number of new arrivals in the hedgerows. 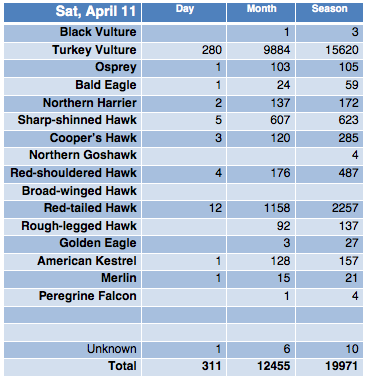 Some species in very disappointing numbers or virtually absent (thrushes for example). No mid-May migrants noted. SATURDAY: Some rain overnight, else SE wind becoming W or WNW and partly sunny. May be some hawks but I think is more promising for songbirds. Or not. Not seems to be an option. SUNDAY: Light and variable (probably N close to the Lakeshore) and mostly sunny. More promising for songbirds I think. conditions – immature buteos rendered almost transparent by the bright backlighting. Highlights were very distant Peregrine Falcon that triggered interesting discussion about identity as it soared in isolation from other birds. Also an immature Red-shouldered Hawk – same scenario – interesting study bird for separating young buteos. 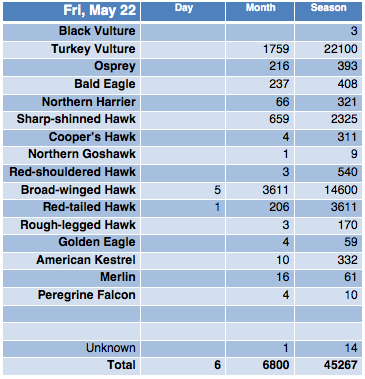 As always on off-wind days in May, it is difficult to tell if a bird is “local” to avoid counting more than once. Morning walk of the hedgerows found songbirds “stuck” here as one would expect given the winds – essentially the same birds in the same places as yesterday. Several loons went by as did a Green Heron. Blue Jay migration along the lakeshore continues. FRIDAY: SE wind, partly sunny trending to cloudy by the end of the day with rain coming in. Obviously these are our best winds and many non-raptors should be on the move as morning flight or in the hedgerows. Probably a good flight of Broad-winged Hawks and Bald Eagles. Obvious rarity potential. SATURDAY: S wind and rain overnight, W or WNW during the day and mostly cloudy. MONDAY: S wind, rain likely. We’re at the peak of songbird migration so these “question mark” days will likely have birds. WNW wind, overcast, becoming partly sunny. No countable migrating raptors. At this point most of our flight will be immature birds, which are wandering with the wind (and hence won’t be going by on off winds). A few songbirds around but obviously not a migration day. THURSDAY: Light overnight winds, possibly some songbirds. WNW to NW, sunny, probably not many raptors. SATURDAY: S wind overnight, rain likely in there somewhere. Songbird fallout? Else light W during the day, probably not many hawks. MONDAY: Strong S wind, rain likely. Strong west wind all day, mid morning cold front ended the flight. Warblers around before the wind really kicked in and a Forster’s Tern a little east of the usual migration route. NW winds will make for a poor flight. Hot with light and variable winds. Not much moving, at least near the lakeshore. Good variety of warblers and other seasonal migrants. Cooler, WSW-W predicted, might be some hawks zipping past. Light S wind, full sun, becoming N.
MONDAY: S wind, overcast, chance of rain. Some birds probably. TUESDAY: Shift to W wind after S overnight. Not sure what it means. About 300 visitors made for another successful Bird Festival. Lots of great birds were about. Thanks to all our volunteers and visitors! Warm and overcast through about 1 p.m., S wind all day, becoming full sun by 2 p.m. Huge flight started up between 2:30 and 4:30, with 1332 birds in one hour. 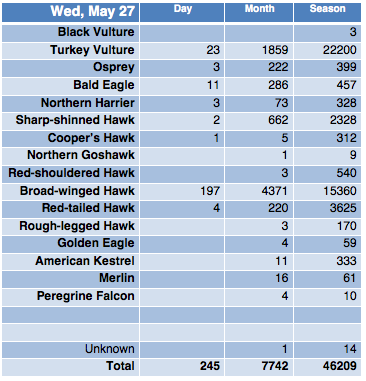 Many Osprey and Bald Eagles, Broad-winged Hawks and a single Peregrine Falcon were observed. Very intense and spread out flight but mostly over the lookout, second field and edge of lake. Observing conditions were difficult. Most birds were seen at low to medium height. A Sharp-shinned Hawk with very little tail was seen, and also a Broad-winged Hawk with very little tail. Massive, impressive kettles of low, thermal using hawks formed during the two peak hours – several with 100 birds or more. Roughly 50/50 Turkey Vulture and Broad-winged Hawks with Sharp-shinned hawk at the top and Red-tailed Hawk, Bald Eagle, and Osprey mixed in. 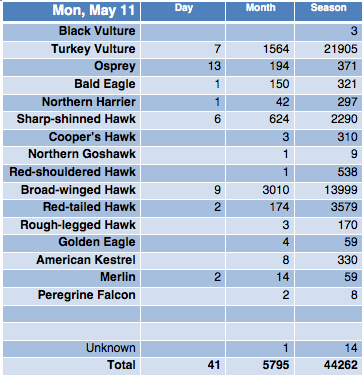 Bald Eagles and Osprey in sight during most of the period. Good warblers in the morning highlighted by Canada Warbler. A low-flying Sandhill Crane was enjoyed by all. Good flight of Blue Jays all day long. SUNDAY: S wind in the morning, partial sun, becoming N in the afternoon. After today’s late-day flight I would think Sunday has potential. MONDAY: N wind, mostly cloudy, and chance of rain. TUESDAY: overcast, strong wind. Birdfest on Saturday! Park in 3rd field lot or at bottom of hill and take shuttle bus to top. Hot, S wind, full sun. Lake breeze took over in early afternoon. After lake breeze took over, moved to south lookout where flight picked up big-time. Birds high all day. Sixty-nine Bald Eagles is a good number for the date. Good morning flight. Red-headed Woodpecker, Greater Yellowlegs were highlights. SATURDAY: Hot, S wind, partly sunny, small chance of rain in afternoon. Could be good for everything! SUNDAY: S wind, overcast, rain likely. Morning songbird fallout? MONDAY: a lot like Sunday. Light S wind through 11 a.m., then Lake breeze kicking in, full sun. We’re in the lull between adult hawks and immatures that are inclined to fly only on good weather. Hopefully the immatures will arrive soon. Decent morning flight of songbirds. FRIDAY: Light S winds, warm, full sun. Lake breeze may take over, else could be a few birds. SATURDAY: Stronger S winds, warmer, partial overcast. SUNDAY: S wind, mostly overcast, could be similar to Saturday’s flight, whatever that ends up being. We are awaiting arrival of young hawks that have no breeding on their mind. Should be any day now. Light wind with full sun, Lake breeze taking over by 10 am. Few. Waiting for favorable weather and immature birds. Songbirds around but no new arrivals. THURSDAY: A lot like Wednesday, with light winds and lake breeze taking over. Expecting few hawks. FRIDAY: Light S wind, full sun. Could be good morning flight and some hawks if the lake breeze can be overcome. SATURDAY: Birdfest!!! S wind, mostly sunny, warm. Could be good. Very light west and/or north winds through the day, heavy fog for 2 hours in A.M.
Juvenile Northern Goshawk at point blank range was bird of the day. South wind becoming WSW and W, sunny to mostly cloudy, sprinkles starting up late in the day, hot. Today’s birds were high and fast moving. Highlight was a Peregrine Falcon. 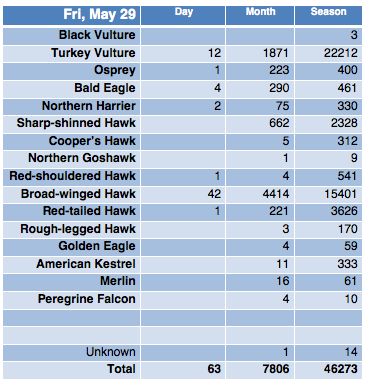 The first few days of May are potentially peak time for adult Broad-winged Hawks. This year we had a large movement (21 Apr) shortly after the arrival of the first birds, followed by a week or more of high pressure controlling the weather in the northeast. Now we arrive at 4 May and favorable winds but few birds. This means that many of our adult Broad-wings passed on a broad, dispersed flight during the time high pressure was blocking the normal passage of fronts we depend on to concentrate birds into huge movements we can observe at Derby Hill. 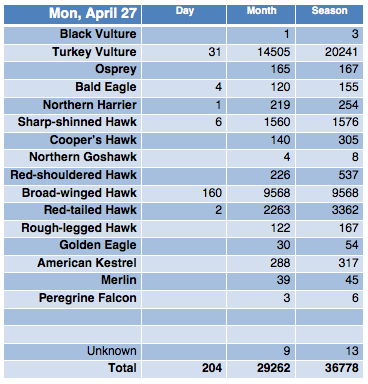 We can now look forward to large May flights of immature hawks, mostly on favorable winds. Good songbird fallout in the morning, with many firsts for the count including: Solitary Sandpiper, Orchard Oriole, Red-headed Woodpecker, various warblers, and a Mockingbird, which is always unusual on the lakeshore. Not much actual morning flight. There were lots of warblers around in the evening, including 2 Cape May Warblers, plus a Clay-colored Sparrow. TUESDAY: Cooler, N wind, mostly sunny. Probably a few birds. Bill Purcell will be manning the clickers. WEDNESDAY: Light S wind overnight could be good for morning songbirds. NW and sunny during the day. Should be a few hawks. THURSDAY: Start of an extended stretch of S wind and full sun. Could be good for songbirds and hawks. Light S wind early, becoming N, full sun. Mostly low birds at the south lookout. Golden Eagle: immatures, as one would expect. No real morning flight, fewer new arrivals noted than were reported from Sunset Bay Park. MONDAY: Light S wind early, becoming WSW, increasing clouds through day. Could be super-huge for everything from songbirds in the morning to raptors throughout the day. WSW wind will mean high birds and probably cutting the corner. Dave will be counting through mid-morning, Bill counting mid-day, Dave back for the afternoon. Dang Dr appt! TUESDAY: NW wind, cooler, clearing. Could be a cleanup flight. Bill manning the clickers. WEDNESDAY-THURSDAY: good-looking overnights for songbird migration, light N or NW wind. Should be hawks. Light N to NW wind, full sun. There was an obvious difference in the feel of the day with raptors moving vs. Friday. Flight low and mostly close over the south lookout. Two light morph Rough-legged Hawks passed the north lookout early in the day. Two flocks of Pine Siskins but otherwise a very disappointing morning for passerines. SUNDAY: Light S wind overnight may be conducive to songbird migration. Light WNW wind and full sun. Hawk flight probably similar to Saturday. MONDAY: SW wind, warm, mostly sunny becoming cloudy. Looks like it will be a whopper for everything. Hawks presumably high up and probably cutting the corner of the Lake. Hawkcount.org is still down. Few raptors today on N winds. Highlight was a light morph Rough-legged Hawk, probably not the last of the season but there won’t be too many from here on out. Some new songbirds in the morning and still in hedgerows in evening. Obvious burst of Palm and Yellow-rumped Warblers and White-throated Sparrows. Blue Jay migration full-on. Field Sparrow at both lookouts and first-of-count Yellow Warbler. SATURDAY: Light and variable wind overnight and into morning, clear, W to NW WIND developing, full sun. Should be good for songbirds in the morning and possibly some hawks if the supply is there. SUNDAY: Light S WIND or light and variable overnight, clear, light SW to W during the day but lake breeze may take over, full sun. Could be big for both songbirds and hawks depending on supply and how the wind plays out. MONDAY: light S wind overnight and mostly clear, S to WSW during the day with hopefully enough strength to hold off the lake breeze. Mostly sunny. Should be huge for songbirds and hawks. TUESDAY: NW wind and mostly cloudy, chance of rain. This will be the change that birds are moving ahead of. 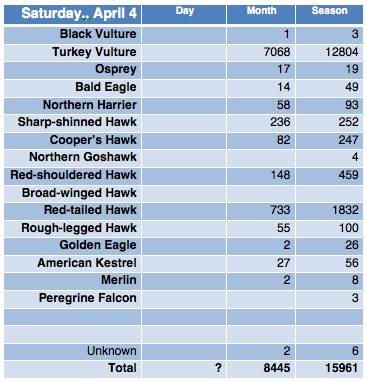 Hawkcount is still down today. At the end of each day I submit the counts and report to Hawkcount and it is then echoed to Oneidabirds, BirdHawk, and our Facebook page. Hopefully the outage will not continue much longer. Few highlights today and only 97 birds on nasty NNE winds, little obvious movement of hawks. Calm in the morning, good flight of blackbirds, swallows, goldfinch. FRIDAY: calm overnight could be good for morning songbirds. NNW wind and mostly cloudy, may be more birds than today. SATURDAY: another calm overnight, W wind, and mostly sunny. Could be good. SUNDAY: W or WSW wind, clear, could be good. MONDAY: SW wind and partly cloudy. Huge movement expected somewhere between Saturday and Monday but I’m not sure which day it will be. Hawkcount.org website is currently down. THURSDAY: Light and variable overnight with N wind and mostly sunny. Could be good for songbirds in morning and probably raptors similar to what we’ve been getting. FRIDAY: N wind, partly sunny, similar to Thursday I imagine. SUNDAY-MONDAY: WSW or SW, mostly sunny, has hugeness written all over it. If it doesn’t happen somehow earlier, should be producing massive flight of Yellow-rumps and the other species that should be here by now but are mostly not. Possible massive push of Broad-winged Hawks. Sunny with 10-12 mph WNW wind. Broad-wings zipping by the south lookout on what was mostly a tail wind. Sunny and slightly warmer but with NW winds. There should be some hawks. About as many as could be expected under the conditions. Possibly more sun, possibly more west to the wind, possibly a few more birds on the move. NW wind, mostly sunny until 2:00 p.m. when clouds rolled in and the flight shut down. Trickle of Broad-winged Hawks similar to Saturday. Low-passing Merlin at the south lookout was probably the highlight. Only the songbirds currently “stuck” on the lakeshore were around in the morning, and no morning flight to speak of. I had hoped for new birds but it was not to be. Brown Thrasher continues to sing loudly, a few Ruby-crowned Kinglets about, 8 Pine Siskins, a few loons moving, and the first few migrating Blue Jays were noted. MONDAY: NW wind, overcast, chance of rain. Not a good formula for hawks. Bill Purcell will be manning the clickers. TUESDAY: N or NW wind, partly sunny, warmer. Probably not big flight but..? WEDNESDAY: Much the same as Tuesday but I think a little more potential for songbirds overnight. THURSDAY: Light S wind overnight, becoming NW. Could possibly be the best of the four days. We’ll know more as the week progresses, but until warm and cold fronts start marching through again birds will likely be trickling rather than pulsing. NW wind, cool for the date, full sun. their will, flight was mostly between the lookouts with little to the south. This of course is an interesting and perhaps somewhat counter-intuitive phenomenon – ie, birds flying closer to the Lake on NW winds than might be otherwise expected. There was very little indication of inland dispersal such as big kettles on the back horizon that never passed the south lookout. Very little other migration noted, but there seem to be more “stuck” songbirds at the north lookout tonight than earlier in the day. Calmer wind overnight could foretell a nice movement of late-April birds Sunday morning. SUNDAY: Light and variable winds overnight look good for a songbird movement. NW winds, light to moderate, partly cloudy during the day. 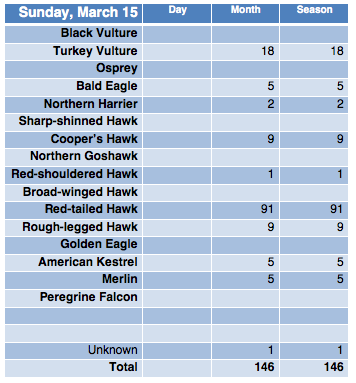 Since we had hawks today there will likely be a flight of some kind Sunday. MONDAY: Stronger NW wind, full overcast, rain likely. Doesn’t sound good. TUESDAY: NW wind, partly sunny, warmer. Probably more hawks than Monday. Tuesday/Wednesday overnight could be next songbird opportunity. Weekend counts expected to be at south lookout. Please park in parking lot. Normally we don’t allow parking at north lookout on weekends but since the count will be at south, please drive slowly on the dirt road if you do go up. NW wind, cold for the date, mostly sunny. No evidence of raptor migration. Few birds around, little evidence of migration today. One American Pipit flew by south lookout. SATURDAY: WNW or NW wind, mid-40s is cold for the date, mostly sunny. May be a few birds but Sunday likely better. SUNDAY: Mostly calm predicted for Sat/Sun overnight – good chance for morning songbirds. N or NW wind developing by day, possibly lighter than Saturday, partly sunny. May be a few birds. MONDAY-TUESDAY: stronger NW winds, partly or mostly cloudy, chance of rain. Not looking good. Best chance of the next few days for new songbirds is probably Sunday morning. 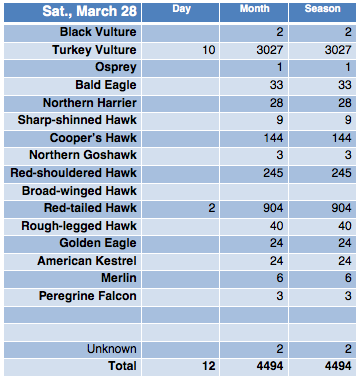 Temp 0-3 C and winds W 10-20 don’t bode well for an April 23 hawk flight. Friday could be a repeat of today. Wind varied from moderate S to light WNW and finally light and variable. Drizzle through parts of the day. Broad-wings on the move during the two dry periods. 96 Common Loons, singing Brown Thrasher and Yellow-rumped Warblers moving by. Chilly with rain likely for at least part of the day but it is Broad-wing season and they may be moving on the predicted west winds. Rain in the morning, W to WSW wind, many sunny periods and a few light showers. After rain stopped around 10 am, a huge flight of Broad-winged Hawks ensued. Many 50-bird kettles and some in the 100+ range. W and WSW wind translated to very high birds (3000-5000 ft) moving fast and cutting the corner of the Lake. Thus some that “jump off” and cut the corner are missed and Derby Hill generally will have a lower count than Braddock Bay. Other species on different trajectories may have been missed. Very little songbird movement in evidence. Twenty Common Loons. Intriguing bird soaring with Broad-winged Hawks remains unidentified. May post photos when time allows. WEDNESDAY: Cooler, WSW or W winds, mostly overcast, chance of showers. Possible cleanup flight from today. Bill Purcell is covering count. THURSDAY-FRIDAY: Cold by April standards, strong W wind, overcast, rain likely. Bill manning the clickers on Thursday. Sounds bad for hawks. Strong SE wind and rain early AM, unexpected full clearing at midday, becoming cloudy but rain holding off until end of period. Extremely low birds (below tree tops) and most flew by over the lookout. 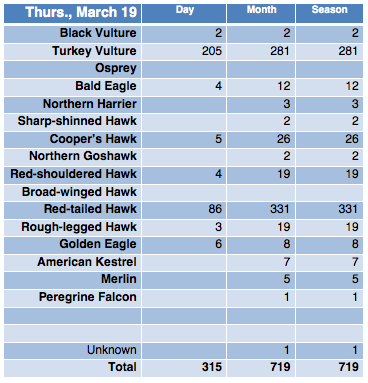 Excellent flight of Northern Harriers (24), American Kestrels (57) , Sharp-shinned Hawks (80), and nearly (but not quite) a new all-time single-day record for Merlin (12). An adult Peregrine completed a sweep of the falcons. 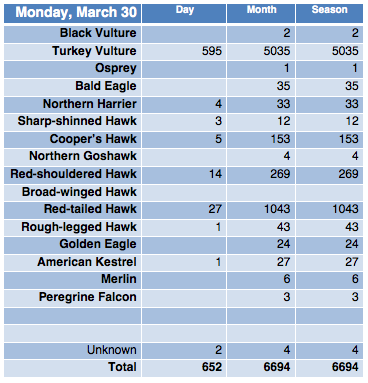 Six Rough-legged Hawks (about half dark morph) is good for the date. “Rainbirds” (Osprey, Northern Harrier, falcons, Rough-legged Hawk, Sharp-shinned Hawk) dominated early and never relinquished their influence on the flavor of the flight, even when the sun came out. Red-tailed and Broad-winged Hawks never kicked into gear, probably due to strong headwind component (Red-tailed Hawks showed obvious struggling). Good looks and diversity if not huge numbers; only Northern Goshawk and Red-shouldered Hawks were missed among the regular raptors. 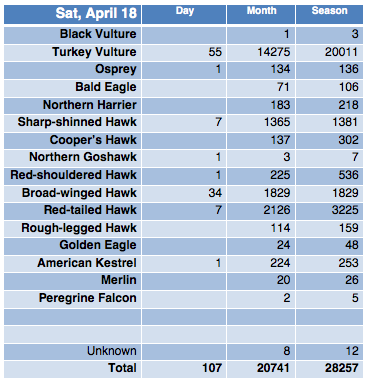 Turkey Vultures may not have liked the headwind but we are past the peak movement of adults and before the pulse of immatures and that partially explains the low number. Same may be true of Red-tailed Hawks. Low Golden Eagle and Bald Eagles were nice. Some new passerines in sheltered hedgerows but no morning flight and no real obvious fallout. High winds may have partially obscured the number of birds around but it didn’t appear to work out today for songbirds. One Green Heron, 8 beautiful Double-crested Cormorants, 10 Pine Siskin, and 2 Sandhill Cranes were highlights. Two medium large shorebirds were poorly seen but intriguing as they overcompensated for the strong SE wind by cutting into the 3rd-4th field. Probably yellowlegs, Upland Sandpiper, Wilson’s Snipe, or Solitary Sandpiper. Two Killdeer. Obvious trickle of swallows. TUESDAY: WSW wind, mostly cloudy, seasonable temp, chance of rain or showers. Obviously a favorable wind if it stays WSW for raptors that got to the lakeshore today. If it turns out mostly rain free it could be good or really good. WEDNESDAY-ON: W winds, mostly cloudy, cold for the date setting up into at least the weekend. We’re going into peak Broad-wing Hawk flight-time and my guess is we’ll see some good movements but I’m not sure when. Could happen on the sunny days if any develop. If good conditions hold off then we’ll be pending a truly monster Broad-winged Hawk flight for end of April or early May. NE wind locally at the site. Nine Mile plume showing ESE. Increasing ESE at end of day. Very little evidence of migration. Rough-leg was a dark bird. MONDAY: Strong SE wind and rain arrive overnight and through the morning. Chance of rain in the afternoon. If songbirds are on the move there could be a huge fallout when the rain hits overnight and into morning. Rain-free periods in the afternoon could produce good to huge hawk flight. It all depends on rain and hawk supply. TUESDAY/WEDNESDAY: WSW wind, cooler, overcast, chance of rain. Our hawks are backed up somewhere and there was little movement today on conditions that were not terrible. The question is where the backup is and whether the current systems will allow things to get unstuck. My guess is Monday afternoon offers the most promise. After that a new pattern will dwell with mostly unfavorable weather. I may try to send a mid-day update to Oneidabirds-L or CNY-RBA. Light SE wind eventually shifting to N, W, and WNW. Very disappointing flight given extremely light winds in the morning. Northern Goshawk is pending review of photos. Little migration in evidence from either Lookout. Very little songbird migration and few birds remained from Thursday. SUNDAY: Light NE wind becoming ESE, full sun. Obviously we’ve had a long “recharge” period and are now pending a big flight. Could possibly be good. MONDAY: Strong SE wind and rain before dawn. Expecting awesome songbird fallout for the date. Overcast but chance of rain diminishing. Forecast has generally been improving and rain-free periods may be all-on for hawks with a potential big movement ahead of the front. Possible big Yellow-rump flight at end of day. They’re coming this way and they look migratory!!! TUESDAY: Cool, W wind, overcast. Morning fog and haze, light wind. Occasional light showers. 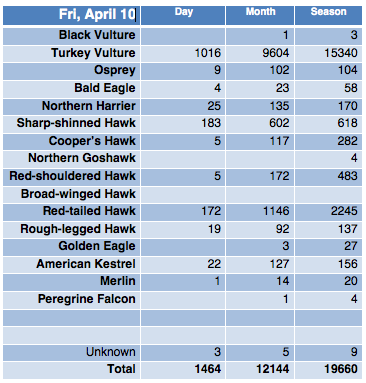 No evidence of any real hawk migration. all the sparrows that could be here on this date. Thrasher, Creeper, both Kinglets, other firsts-of-count noted. Classic fallout scenario played out better than expected. SATURDAY: Light and variable winds becoming W or WNW and mostly sunny. At some point soon things will unstick but not sure if this is the day. Possibly good for passerines. SUNDAY: Light E-ish winds and mostly sunny. Another question mark. entirely overcast, rain predicted. Might be good during rain-free periods if they last any length of time. SE wind most of the day becoming S and suddenly NW around 6 pm. Mostly sunny. SE wind for the wrong reasons. Very disappointing flight. Very high birds, hard to spot. 59 Northern Flickers, 20 Pine Siskins or more, 2 Rough-winged Swallows. Poor morning flight. stops. Looks bad for hawks. SATURDAY: Sunny and mild but WNW wind. Possibly some migration at South Lookout but not very promising. SUNDAY: Mostly sunny, light and variable winds becoming light SE. Lake breeze will almost certainly take over but bears watching. MONDAY: strong SE wind and overcast, rain likely but has potential. Will know more as weekend progresses. Northerly winds through the day. South winds but predictions vary as to strength. There will be hawks even if the lake breeze takes over. 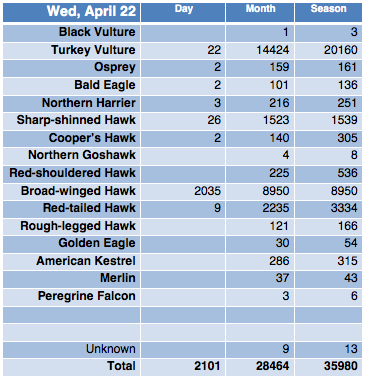 Hawks moving for most of the day but numbers dwindled over the last 2.5 hours. 2 Bonaparte’s Gulls and 40+ N. Flickers on the move, 4 Vesper Sparrows at the south lookout. Much the same with a slightly stronger breeze possible. SE wind becoming S and then SW late in day. Mostly sunny. Warm for the date. Flight spread out over the water for much of the day. Massive late-day movement of raptors ahead of the coming cold front, between 5-7 pm (flight was low and mostly over the North Lookout). Four Golden Eagle in sky at once and 14 total between 4-7 pm. Red-shouldered Hawk: all noted were immatures. Red-tailed Hawks: obvious increase in fraction of immatures but still mostly adult. 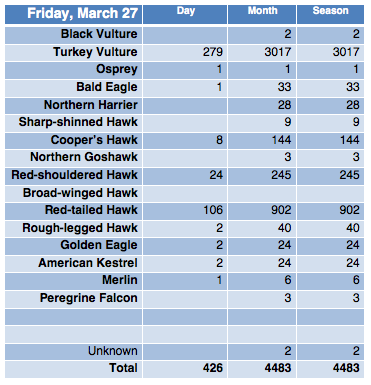 Rough-legged Hawk: Roughly 40% dark. Golden Eagle: all but possibly one were subadults. 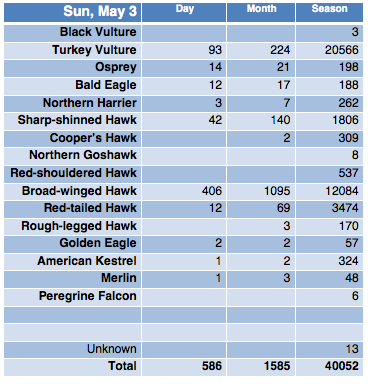 American Kestrel: 45 in last two hours. 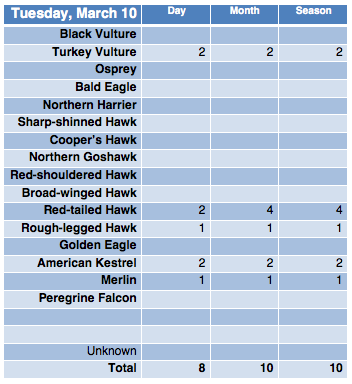 The hawkwatch achieved difficult “sweep” of our 15 regular raptors. PLEASE NOTE: A bird that passed during the 12-1 p.m. hour was “clicked” as a Goshawk. I had reservations about the bird and photos show an adult Cooper’s Hawk. 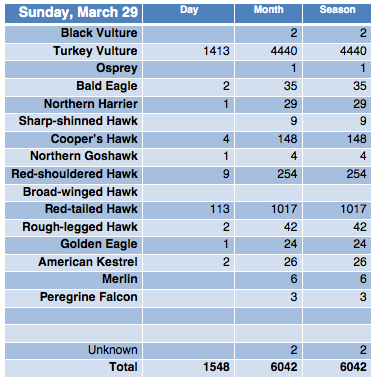 Please remove from eBird lists. Photo of the bird at link below. 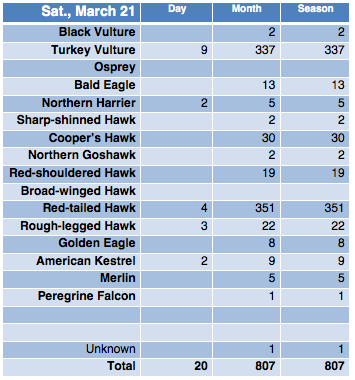 The Goshawk indicated in report passed between 6-7 p.m. 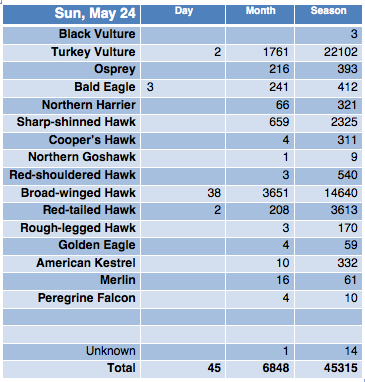 Decent morning flight: 400 Flickers throughout the day. First-of-count: Pine, Palm, and Yellow-rumped Warblers, Fox Sparrow. TUESDAY: Cooler, W or WNW winds after cold front passed overnight, full sun. Cleanup flight from Monday? Bill Purcell will be manning the clickers. WEDNESDAY: NNW wind, possibly lighter than Tuesday, full sun. Could be cleanup flight from Monday at South Lookout. THURSDAY: light SSE wind will hopefully be enough to keep Lake breeze suppressed. Partly sunny. They’re coming this way, and they look migratory!!! Light NW or N wind, full sun, very spring-like conditions. For the third or fourth day the lake has remained ice-free and I think regardless of wind it will now be “open”. Huge flight developed between 1-4 p.m., much of it south of the south lookout. Broad spectrum of species including first Broad-winged Hawks, but otherwise dominated by Turkey Vultures, Red-tailed Hawks, and Sharp-shinned Hawks. Much of the flight was high and distant. 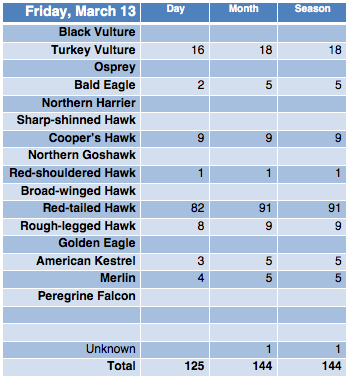 Certainly many birds missed and others under-represented, rarities possibly not detected. Northern Goshawk: immature. Red-shouldered Hawk: many or mostly immature. Red-tailed Hawk: many immature noted. Rough-legged Hawk: 1 dark morph, 3 light morph, at least one immature. Three Sandhill Crane; approximately 10 Pine Siskin at north lookout early in day were first-of-count; at least 10 beautiful Double-crested Cormorants flying in formation. MONDAY: SE wind becoming S, warm, partly to mostly sunny but becoming overcast by sunset in advance of cold front passing Monday night. If we still have supply after today, these are our best winds. All hands on deck!!! Expect many new songbirds on calm wind overnight. TUESDAY: clearing, WNW wind, cooler. Probably not good. WEDNESDAY: Light N wind, cooler still, full sun. THURSDAY: S or SSE wind, warmer, mostly sunny. They’re coming this way and they look migratory!!! Hilltop still muddy. Please walk up or use third-field lot. Strong W wind all day, clearing. Little evidence of migration, but there were a few high birds and all moving very fast through airspace. Neither lookout seemed to have much. 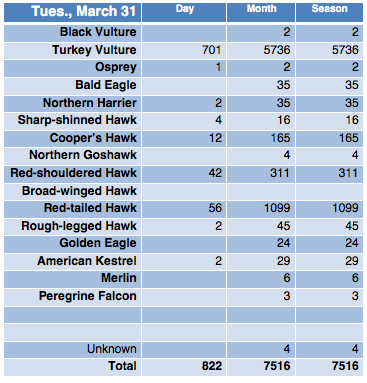 Unknown Accipiter: seen briefly, Cooper’s Hawk or Northern Goshawk. Fourteen Bonaparte’s Gulls, a few Common Loons. SUNDAY: Light SW wind becoming W, full sun. Should be better than today. MONDAY: S wind, warm, sunny to cloudy by sunset. Could be huge flight. TUESDAY: Much cooler, W wind, mostly sunny. Rain has once again caused cars to get stuck at the north lookout, several both yesterday and today. Flight may be at the south lookout on Saturday, but please park at the bottom of the hill and walk up (or in the third field lot) for access to north lookout (until Monday at least). SE wind becoming S and abruptly shifting to W. Overcast. Very high birds after the W wind shift. Unknown Buteo: high-flying buteos, Rough-legged Hawk or possibly Swainson’s Hawk. Red-tailed Hawks: included two dark-morph western birds. SATURDAY: Clearing, strong W or WNW wind, cool. Flight may depend on how much north develops in the wind and what the supply of Turkey Vulture looks like. SUNDAY: Full sun, light SW, warmer. Could be good to very good. MONDAY: SE to S wind, mostly sunny, warmer yet. All hands on deck! Big flight and firsts-of-season expected. Observation Time: 8:00a.m. to 5:00p.m. SE wind becoming strong, mostly cloudy with mid-day sunny period. No rain. Another good flight of Osprey for the date. Red-shouldered Hawk and Red-tailed Hawk still overwhelmingly adults. Three to four dark morph Rough-legged Hawks, rest were light morph. One Golden Eagle was last year’s model. Accipiters overwhelmingly still adults but one immature Cooper’s Hawk noted. Third or fourth-of-count Turkey Vulture with no tail. FRIDAY: Warm front passing overnight and bringing rain/t-storms. SSE wind staying strong and becoming SSW for Friday. Cold front to pass Friday afternoon with a shift to strong W wind. If the rain passes overnight with the front, the few hours in the warm wedge could be raptor madness. Likely to bring many first-of-season non-raptors. Hard to be sure how it will play out. SATURDAY: strong WNW winds and clearing skies. Floating ice may fill Mexico Bay, else expect Caspian Tern. Could be a flight of Turkey Vultures. SUNDAY: Sunny, light W wind, warm. Could be good to super good. Another glorious spring day with temperature maxing out at 3 C. Overcast, a biting ESE wind and rain most of the day. THURSDAY: SE winds and warmer than today, there should be birds if the rain isn’t too persistent. The Hill has dried out enough for parking on weekdays. Third field lot is also accessible. Please use third field or park at bottom of hill on weekends. NE wind, cool, becoming mostly sunny. An excellent number of Osprey for the date. About 10 were seen carrying fish. Good flight of Robins. Ducks were flying around. Very few geese were seen. At least 8 Kingfishers observed. WEDNESDAY: ESE or E wind, cool, overcast, rain expected mid-day. THURSDAY: warmer, strong SE wind and overcast, chance of rain. Obviously these are our best winds but will depend on rain. Stationary front to our south may also influence flight. FRIDAY: Warm, S winds but overcast and rain likely, becoming W wind. SATURDAY: W wind and cold. The third field parking lot is now accessible. Expect drive-up access to hill on weekdays shortly. Light ESE wind and overcast becoming NE and mostly sunny. Stationary boundary remained to south of lookout, may have cut off birds. Obvious movement of Northern Harriers and American Kestrels. Good morning flight of Red-wings, Grackles, Cowbirds, Robins. Five Kingfishers and 12 Mourning Doves. Common Grackle with white primary feather shaft (presumably the same bird as last year) has returned. Small groups of Canada and Snow Geese. One line of Snow Geese had an interesting bird tacked on the end – possibly Black-bellied Whistling Duck or an exotic species/escapee. TUESDAY: N wind, overcast, rain likely. Doesn’t seem like a good forecast for hawks. WEDNESDAY: ESE wind, rain likely especially in afternoon. Questionable for hawks. good depending on supply and whether the rain holds off. FRIDAY: Warm S wind, rain likely. Too early to say but could bring a burst of migrants. W wind, overcast, cold, snow began about 2 pm. 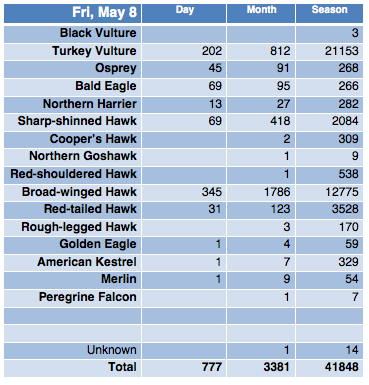 No real evidence of hawk migration. Seven Rusty Blackbirds singing in the evening at the North lookout. Song Sparrows have arrived, Tree Sparrows singing occasionally. Evening Ring-billed Gull flight. MONDAY: Stationary boundary between warm and cool air expected to lift to our north allowing temps into 50s. Wind predictions vary from SSW to E, chance of rain early and late. Overcast, possibly becoming partly sunny mid-day. Could be good, given rain in the forecast. TUESDAY: N wind, cooler, rain likely all day. Sounds bad. WEDNESDAY: NE wind, cool, rain, also looks bad. THURSDAY: SE wind, possibly overcast, chance of rain. If the forecast improves it could be good. Monday is the pick until at least Thursday. NW wind and very cold for the date, becoming partly sunny. Count total (if any) pending receipt from G. Smith, who covered the watch. SUNDAY: W wind and cold, overcast, not very promising. MONDAY: SE becoming E or NE, overcast, temp to 50F, rain possible. Not terrible weather but will depend on the rain. Foggy to start the day, eventually clearing and becoming mostly sunny for most of the day. Wind light S shifting abruptly to N.
and eventually spreading inland in response to a shift in wind to N. Count shifted to South lookout. Buteos and accipiters were mixed in. 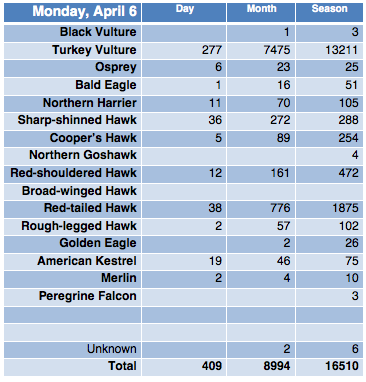 Final count of 4108 Turkey Vultures is just short of 2014’s day-record. Black Vulture seen from South lookout mixed in with Turkey Vultures became third of season. No Golden Eagle and few Bald Eagles. Flight stopped abruptly about 4:00p.m. without an obvious change in weather (early in day given the volume). May mean supply ran out or corresponded with trough passage. A Glaucous Gull was seen from the South lookout. Some geese but not the expected big movement. First-of-count included Chipping Sparrow, 3 Rusty Blackbirds, and a Belted Kingfisher. Open water caused by Thursday’s S wind contained good number of ducks, including several dozen Green-winged Teal. SATURDAY: rain coming in overnight with a shift to strong NW wind and cold. Snow showers possible in the morning but becoming partly sunny. Looks bad given that the flight suddenly stopped on Friday with fly-able hours left. Gerry Smith will be covering count. SUNDAY: Cold, mostly overcast but lighter wind. Do not expect much. MONDAY: Overcast, light E wind becoming N, rain expected. Not good. Rain in forecast for much of next week. Too early to say but there will almost certainly be good flights mixed in somewhere. SSE wind, warmer, mostly sunny until later in day when sprinkles rolled in. 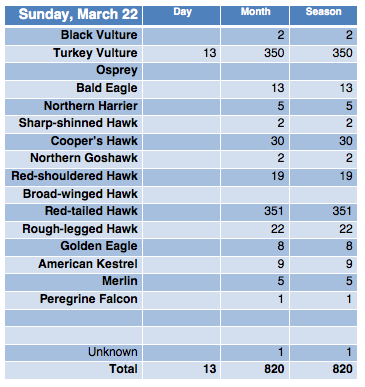 Strong flight all day, including late-day Rough-legged Hawks, American Kestrels, and Northern Harriers. Some immature Red-shouldered Hawks seen. Virtually all accipiters were adults. Golden Eagle was an immature. 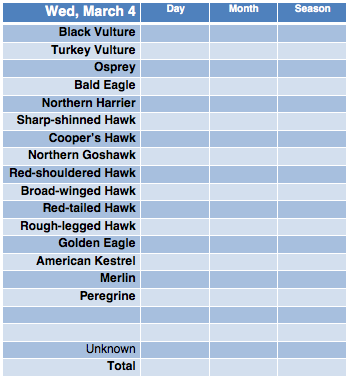 Rough-legged Hawk: At least 8-10 dark morphs. FRIDAY: Light WSW wind becoming W or NW, warm, partly sunny with small chance of sprinkles. Could potentially be very good but birds likely higher or possibly spreading out. cold, snow showers. If wind is strong could see off-wind Turkey Vulture flight. SUNDAY: cold but lighter NW wind. Neither weekend day is very promising. Light NNW wind and full sun, but cold. Late burst of Turkey Vultures and Rough-legged Hawks promising for Thursday. Rough-legged Hawk: 2 dark morph, 2 light morph, 1 unknown. Lakes. Won’t be long for them now however. Raven seen soaring high in thermal with Turkey Vultures and eagles. A few Redpolls and Cedar Waxwings around. Small evening flight of Red-winged Blackbirds, Common Grackles, and a few Brown-headed Cowbirds. THURSDAY: SSE or S wind, mild, chance of rain early and late but clear to partly sunny through main part of day. Turn it up to 11 and rip off the knob! Big flight of raptors and other species of the date expected. We have snow/mud issues atop the hill so please park at bottom and walk up. FRIDAY: Rain during the overnight, wind becoming light W wind and partly sunny. Could be good to really good. SATURDAY: NW wind, cold, partly sunny skies, snow possible. Turkey Vultures like it windy so could be off-wind flight but likely little else. Light to moderate N to NW wind, mostly sunny, cold. light morph, 1 dark morph. No Golden Eagle. Estimate 10,000 Snow Geese, none seen coming back. Possible albino Snow Goose. Killdeer, Tree Swallow, but no new arrivals. WEDNESDAY: Probably like today, light N or NW wind, full sun, some birds. THURSDAY: SE wind, partly cloudy but forecast has improved substantially. Some chance of rain but could be big flight. Note that we don’t have any real parking atop the Hill – still lots of snow and muddy. Please park at bottom of hill and walk up the road. FRIDAY: Light W wind after rain on the overnight. Cleanup flight? SATURDAY: Strong NW wind and precipitation. Not good. WSW winds eventually becoming strong W. Rain early, then overcast and clearing by 4 p.m.
Little diversity beyond Turkey Vulture reflects non-ideal migration conditions. Good flight of Turkey Vultures on strong winds. Strong W winds equal fast moving birds. TUESDAY: light NW wind and partly sunny, cool. I’ll be honest: flight is a question. WEDNESDAY: very similar but mostly sunny. THURSDAY: Warm on SSE winds and partly sunny. Chance of precipitation increasing but right now looks very promising for good flight of everything. Light N wind and full sun, becoming SW later in day and triggering good flight. Shift at noon to the south lookout for a much better view of the birds. Eventually SW wind took over and flight moved to north lookout. Diversity mostly lacking. One beautiful Golden Eagle and a Northern Goshawk late in day. Some blackbirds in the evening but otherwise not terribly impressive. MONDAY: SW wind increasing as low approaches, becoming overcast and shift to strong W wind with snow or rain. There could be some migration during gaps in precipitation. Turkey Vultures, in particular, love it windy. TUESDAY/WEDNESDAY: Light W wind becoming N and partly sunny. THURSDAY: Good S or SE wind but possible rain. NW wind and very cold for the date, full sun. Bad “heat” shimmer. Very little migration. Raptors seen were mostly in hunting mode, but a few passing the site were counted if not reasonably expected to be seen again. Snow Goose flocks coming back, ie, birds seen passing yesterday were today heading back to the Finger Lakes. Numbers relatively small. Our huge Snow Goose flights continue to be “pending”. For comparison, 2-3 years ago most Snow Goose migration was complete by 15 March. We are also still in “pending” mode for a big flight (rivers) of Red-winged Blackbirds and Grackles. Sunday morning/evening? Later this week? SUNDAY: In principle, light SSW wind and cold start but quick recovery to low 40s on full sun. Wind increasing from the SSW. 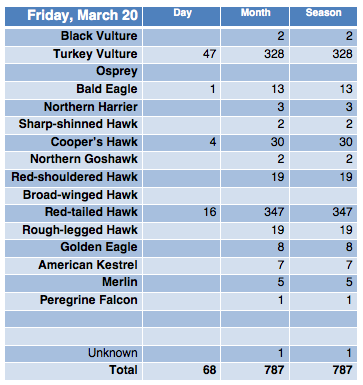 Should be a good movement of raptors and possibly American Robins or icterids (morning and evening). Light NW wind and overcast, becoming WNW and partly sunny for part of afternoon with passage of cold front. Brief flurries but otherwise dry. Substantial open water visible from North lookout. Cleanup flight from Wednesday, spread out between North and South lookout, ahead of the cold front. A little unexpected, but logical in retrospect. Lots of birds around generally. Flight got very high in afternoon (limit of binoculars). Birds undoubtedly missed. First Osprey of season. First real groups of Snow Geese passing (750-1000), with only a few seen returning (~100). Snow Geese on previous days passed then came back, a fascinating “aborted-migration” phenomenon difficult to observe among other species. Smaller numbers of Canada Geese. 11 American Wigeon flew from ditch behind South lookout. Killdeer everywhere. 3 Great Blue Heron. Many European Starlings, Red-winged Blackbirds, and Am. Robins around. Lots of actual migration or at least migratory restlessness in evidence. Saturday: NNW wind and very cold for the date, morning flurries, becoming sunny in afternoon. The cleanup flight was Friday, so expect Saturday to have very few raptors. Sunday: SSW wind and temps recovering to low-40s on full sun. Expecting a good flight of everything. showers. Cleanup flight? Note: any resemblance between predictions and reality is purely coincidental. Virtually calm wind, overcast and hazy, mid-40s to start the count. Light rain started late-morning and quickly turned to snow. No cleanup flight even. A few Killdeer and Great Blue Heron passed before the rain started. Decent groups of American Robins and Red-winged Blackbirds early. Friday: NW wind and snow showers, overcast. Not promising at all. Saturday: More NW wind but no snow, reaching only mid-20s F. Unlikely to produce much even if partly sunny. Possible cleanup flight. Sunday: Cold start but S wind and mostly sunny. After three days of recharge it could be a strong flight. SE winds and mostly clear to start, clouds increasing and rain arriving around 3 p.m. EDT. Strong, low, raptor flight from mid-day to start of rain. Good movement of all the expected raptors with only Merlin and Northern Goshawk missed. Cooper’s Hawk and Red-shouldered Hawk here in good numbers finally. First Tree Swallows (5); at least 30 Killdeer. American Robins and Red-winged Blackbirds in the morning. Thursday: Cloudy with light and variable winds, rain likely from mid-morning on. Could be a cleanup flight from today, or better if the rain holds off. Near record cold for the date at start of count, but good recovery to low-30s, light NW wind and full sun. or Merlin and few accipiters. Not a lot of non-raptor action. 1 Pileated Woodpecker seen. the rain and probably lots of Robins, Red-winged Blackbird, Grackle, etc. Thursday: light S wind early in day becoming light N, rain developing mid-day. 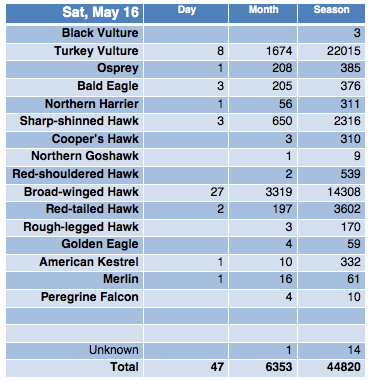 Could be decent raptor flight and there should be many songbirds around. Friday: NW wind and cold. Beginning of a recharge period. NW wind, very cold for date, bright sun. Tuesday: Clear sky will lead to record low temp near 6F overnight. The day should make a good recovery reaching mid-30s in the afternoon on full sun and light NW wind. If the wind stays truly light there could be a good flight especially in the afternoon. Wednesday: SE winds arrive and bring temps to mid-40s and increasing overcast with possible rain especially near mid-day. Could be good migration outside of any rainy periods. Thursday: SW wind and overcast, rain predicted. NW wind and very cold for the date. Bright sun. No migration really. Monday: Very cold and NW winds, but mostly sunny. Probably no migration. Tuesday: Light and variable winds, mostly sunny, temps rebounding to upper 30s. After four days of recharge I expect a good flight. Wednesday: SE winds and temps to mid-40s, but becoming overcast and rain predicted. Expect songbird migration and maybe raptors if the rain lets up. S wind but snow turning to rain. Few breaks and few raptors. Three migrating Great Blue Herons; American Robins and Red-winged Blackbirds; Redpolls continue; large open water spot has developed on Lake Ontario because of S wind blowing pack ice away from shore. Wayne Fidler reported big gull flight after clearing (>4000 birds) late in day and more blackbirds on the move. Sunday: NW winds and very cold, lake effect snow expected SW of count site but possibly sunny elsewhere. Doesn’t sound too good for migrating raptors. Monday: Continued very cold for date but mostly sunny, NW winds letting up somewhat. May be a few birds. Tuesday: Light and variable or light N wind, temps recovering, mostly sunny. Expect good flight. SE wind but overcast. Blowing snow moved in about 11:30 EDT thus ending the count. Disappointing. 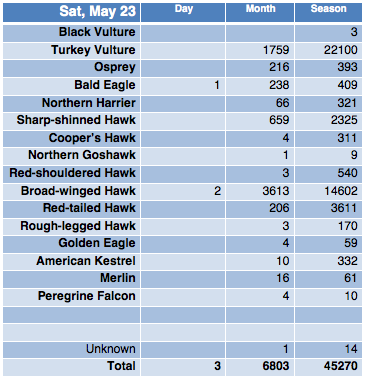 Cooper’s Hawk display-flapping and seen escorting second bird from airspace. One Snow Goose was first of season. Saturday: SSE wind and overcast, temp to 50F, with abrupt shift to strong WNW in mid-afternoon. Rain likely ahead of wind shift but if it holds off until afternoon there could be some birds. Sunday: NW wind, snow, and very cold for the date. Likely no count conducted. Monday: Continued cold, NW wind, but mostly sunny. Flight is questionable, probably not good unless wind turns out light. Tuesday: Transition day with light and variable winds, mostly sunny, and temps in low 30s. Unexpectedly light N wind and full sun, but cold. Several days of “recharge” resulted in good pulse. Friday: Becoming overcast on the overnight, SSE wind and good chance of rain, warmer. Has obvious potential given today’s results if the rain holds off. Saturday: S wind shifting to W, rain likely, temp to 50F. Flight is a question. Sunday: NW wind and cold, snow. Monday: NW and cold, but clear. Flight is a question. NW wind with lake-effect snow band set up SW of watch site. Very unfavorable. Thursday: N wind and still cold, but full sun expected. Not a great setup for raptors but there could be a few. Snow Geese staging to our south may try a first flight (and may turn around). Friday: SE wind, temp to upper 30s, becoming overcast with increasing chance of precipitation. Could be good given the three days preceding, and if rain holds off. Saturday: Gusty S wind becoming W, temp in low 40s, rain likely. Not very promising. Sunday: NW wind and cold with snow. Bad conditions, likely no count conducted. Recovery begins on Monday with better conditions for mid-week. Strong NW wind, no count conducted. Wednesday: Strong NW wind, cold, and snow; likely no count conducted. Thursday: NW wind, cold but clear. Possibly a few birds if the NW wind isn’t too strong. Friday: SSE wind with increasing clouds. Precipitation a question mark but could be good. Light SE wind becoming S, diffuse sun, temp to 50F. First Great Blue Heron. 1500 American Crows. Tuesday: Rain coming in on the overnight, shift to strong NW winds, likely no count conducted. Wednesday: Strong NW wind and very cold for the date, likely no count conducted. Thursday: Transition day with light NW or W winds and becoming sunny. Friday: Looks promising for a good flight. NW wind, cold and snow. Monday: Shift during the overnight to light S or SE wind, mostly cloudy but no rain, temps recovering to mid-40s. Should be some birds ahead of coming cold front. Tuesday & Wednesday: NW winds and cold, especially Wednesday. Likely no count conducted. Thursday: Transition day, possibly sunny but cool on light winds. Friday: Looking a little better than Thurs. Light S winds, scattered rain throughout the region. Sunday: NW wind and cold; likely no count conducted. Monday: nice recovery to SW wind and warmer, partly sunny. Certainly, if even intermittent sun, some birds will be on the move given the wind. Tuesday/Wednesday: terrible March weather, likely no count conducted unless Monday sees a big movement of Turkey Vultures. S or SE winds all day with diffuse sun, temperatures in mid 40s. Of those noted: 3-4 dark morph Rough-legged to 1 light morph Rough-legged. A few robins, larks, blackbirds. Phil Taylor picked out a Glaucous Gull. Saturday: SW wind and rain, looks bad. Sunday: NW wind and snow, expect no count conducted. Monday: similar to Friday, looks good. S wind, warmer, partly sunny. Tuesday: simply awful conditions, expect no count conducted. I’ll show mercy and stop here. NNW winds stronger than anticipated, full sun, no birds seen from either lookout. Friday: Cold start but reaching low 40’s on SE winds and partly sunny. Favorable conditions for migration. Saturday: SE winds but rain predicted all day. Likely a rainout. Sunday: NW winds and colder. Expect no birds. Monday: S winds and warmer, partly sunny. Seems promising. Light to moderate W winds, haze/fog giving way to full sun around noon. tendency to develop Lake breeze with northerly component. A few crows on the move, redpolls continue. Thursday: Light NW winds, cool, mostly sunny. Could be a few birds. doesn’t end up mostly east. Predict dozens of birds. Saturday: periods of rain on S or SSW winds. ? Sunday: colder with light snow. Monday: rebounds to 50, possibly a good flight. Light S and diffuse sun, temps in upper 40s, low 50s. ~2000 Crows, 16 Killdeer is an excellent number for the date. Obvious shift to spring migration vs. previous days. Wednesday: W or WNW winds, cooler but clearing. Not very promising. Thursday: light NW winds, cool, clear skies. Not promising but not awful. Friday: ESE winds, increasing clouds, warmer. Should produce a few birds. pattern. Braddock Bay had only 2 TV so probably didn’t miss much. Wednesday: Similar to Tuesday but wind shifts W. Probably a few birds. Thursday: Light and variable, partly sunny, cooler. Monday: snow at least in the morning, west winds all day. Looks bad. Tuesday: S winds and warmer at 41F, partly sunny. Should be a few birds. up, skies remain partly sunny and temp stays up. Could be a few on the move but at this point we’re waiting for birds to reach areas south of us. starting up. Does not look promising. Sunday-Monday: Not good. partly sunny, but still cold. Better days after that. Wednesday-Thursday looking bad with W and NW winds – likely no count. lookouts. No parking at North Lookout for time being.